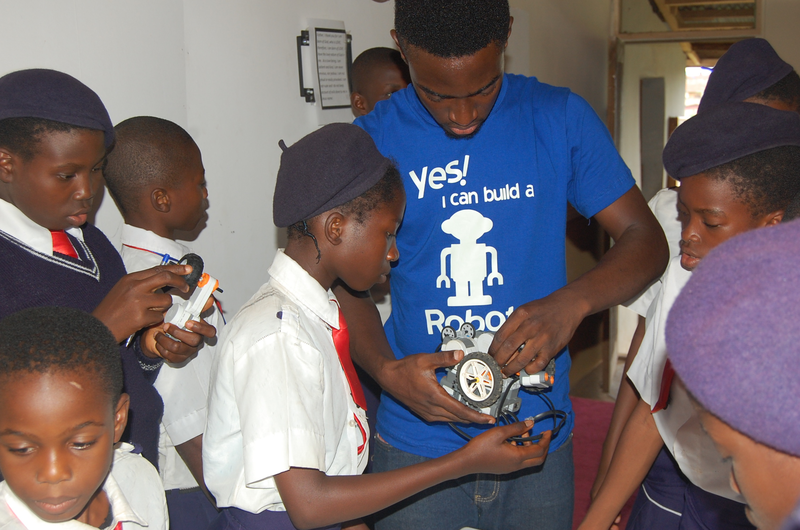 Welcome to Nigeria’s robot school! Today is UNESCO’s World Science Day for Peace and Development. To celebrate, read the story of ‘Project 10,000 Kids’ that aims to teach thousands of Nigerian schoolchildren how to build robots! Can you imagine walking into a classroom when you were 10 and being told your task for the day was to build a ROBOT? For 10,000 Nigerian schoolchildren that is exactly what will happen, thanks to ACI Computer Education, an Obafemie Awolowo University based organisation that provides technology education to young people. ACI was founded by Olaoluwa Balogun, an OAU alumnus who wants to transform the education system in Nigeria by empowering children to build useful technology. The goal is to see young Nigerians become computer programmers and tech enthusiasts in a few years to come. There are 30 million primary school-aged children in Nigeria, of whom an estimated 8.7 million are not enrolled in school. Of those students currently in primary school, less than one third will attend junior secondary school and even fewer will proceed to senior secondary school. However. ACI sees Nigeria’s huge youthful population – Over 70% of the country’s population of 182 million are under 30 – as a fantastic opportunity. “The major criterion for a great future for the country is sound education for its kids and youths,” Balogun has said. They also believe you can’t create innovators and problem solvers by simply focusing on memorising academic materials and passing exams. The project which is tagged: ‘Project 10,000 Kids’ targets 50 students in 200 secondary schools across Nigeria. Besides the secondary school students, the organisation will also train 50 children at the Kids and Teens Resource Centre, Akure, and 100 children at two orphanages in Lagos. What a fantastic initiative. Read more about how new technology is shaping the new Africa in our blog: 7 young African entrepreneurs to watch out for! To support projects like ‘10,000 kids’ and those like it, show your support for the Global Goals including Goal # 9 – Industry, Innovation and Infrastructure which aims to promote inclusive and sustainable industrialisation and foster innovation.